When my friend Amy from Learning Lessons from Mrs. Labrasciano said she was going to host a holidays around the blog linky, I jumped on that right away. I have no products to share today, but it's just a good old fashioned post with a holiday that I celebrate, which may not be familiar to many people. I'm Muslim and follow the religion of Islam. We have two major holidays in a year. The holidays align with the lunar calendar, so dates move back about 10 or so days each year. These two holidays are called Eid Ul-Fitr and Eid-Al-Adha. The former is celebrated after the month of fasting called Ramadan, where Muslims don't eat from sunrise to sunset. The purpose being learning self control, self restraint, empathy for those around the world with little to nothing, and learning to live a more balanced, simple life with appreciation for what God has created and given us. It's supposed to kind of be like a spring board to take off doing great things for the rest of the year. That holiday took place over the summer this year. The latter, Eid Al-Adha is a second celebration that just happened in the beginning of October in the 12th month of the Islamic lunar calendar. I would love to share a little about it today. Eid Al-Adha marks the end of a pilgrimage that millions of Muslims around the world do each year. This pilgrimage is called Hajj and lasts for ten days. They travel to the city of Mecca in Saudi Arabia, where they perform a series of rituals and travel to different sites, where they ask for mercy, forgiveness, and pray for others and themselves. One of the rituals includes walking around the Kaaba 7 times, while reciting whatever prayers they want. If a Muslim performs the Hajj with pure intentions, it is said that all their sins from the past are erased and they get a fresh, clean slate to continue on in their life. Below is a picture of Muslims circling the Kaaba. The Kaaba is a cube building, that we believe was first built by Prophet Adam and later rebuilt by Prophet Abraham. (Side note - Muslims believe in a David, Moses, Abraham, Adam, etc. who are mentioned in the bible. We consider them Prophets. Jesus a very loved, revered, and important Prophet in our religion). Anyway, back to the Kaaba -it is the center of the Muslim world, and when we do our 5 daily prayers, we face in the direction of this site. We do not worship the Kaaba. We worship God, in the direction of the Kaaba. It is covered by a silk cloth and embroidered with gold verses from the Quran. It is replaced every year! During the pilgrimage, women can wear simple clothing, but men are required to wear 2 pieces of plain, white clothes/clothing so that no one is distinct by their status because of the clothes that they wear, and that everyone is equal in the eyes of God. This Mosque is constantly under construction and levels are being built to accommodate the millions of Muslims that travel here during this time of the year. On the 10th day of the Hajj, Muslims celebrate Eid Al-Adha. The term technically means "The Feast of the Sacrifice." It reminds us of a story of Prophet Abraham that is written in our holy book, the Quran, and the trials he went through. Here is a little excerpt I took from a website that explains this a bit. "Eid-Al-Adha is one of the major holidays of Islam. According to Muslim tradition, it celebrates the sacrifice that Abraham was willing to make of his own son Ishmael when he was commanded to show his commitment to Allah (God). At Allah's direction, the angel Gabriel substituted a lamb for Ishmael, after Allah was convinced that Abraham would indeed sacrifice Ishmael to prove his faith." So 1/3 of the meat is distributed to the poor, and the rest is used to eat in celebration and a feast. On the day of Eid, we wear new clothing, gather together with family and friends, give gifts, go to the Mosque to pray, and just spend time together. Now that I've given some background on this special holiday in a Muslim's life, I wanted to share with you how we celebrated it in school this year. In my class, we had a party. I made these goodie bags. It says Eid MuBAAAArak. That means Happy Eid. Do you get the pun on MuBAAARak with the sheep?? Get it? Ha? I also took the opportunity to make each student a cute little pen with a little message from me. That day in school was filled with food and fun! We watched movies, played games, ate, ate, and then ate some more, and had cupcakes leftover for three days. 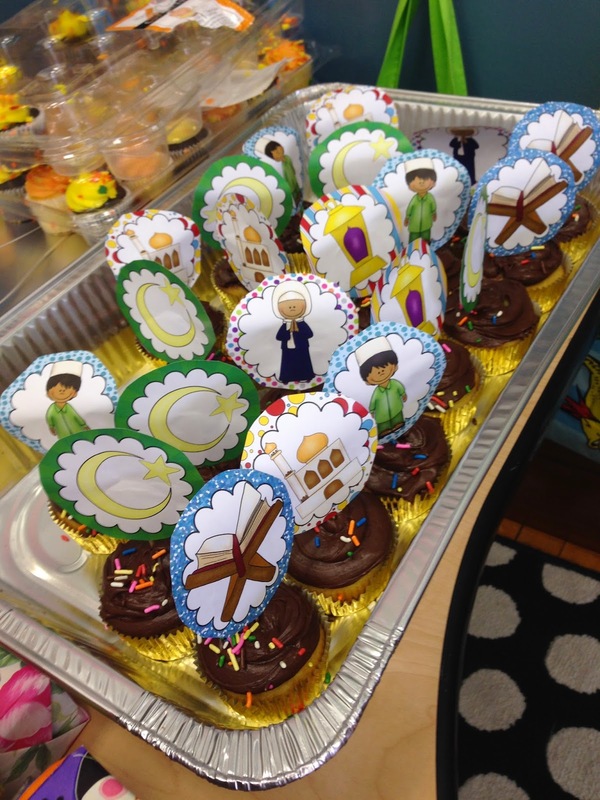 The other 2nd grade teacher made some cupcakes, and I made these cute little cupcake toppers with clip art from Educlips. I loveee that she had a clip art set with Islamic symbols! How awesome! Students did a grab bag exchange. We did a few activities such as an acrostic poem for Eid Al-Adha. Another teacher used my sheep template to put it on top of her poems. 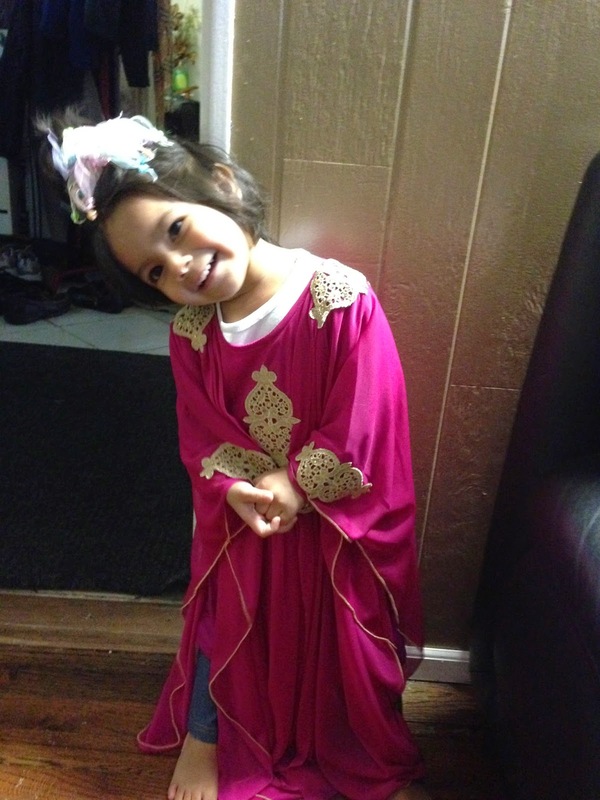 Random insert of what my baby girl wore on the actual day of Eid. This is a project a preschool class did. How cute! Overall, it was a really great day. Plus, the party was after a full week off from school we had to celebrate the holiday! My mom, dad, and youngest sister actually went on the Hajj pilgrimage this year. It's a tough and expensive process, but something that is worth it and people who come back from doing it, long to do it again and again. There is something so spiritually cleansing and beautiful in an event in which Muslims gather from all over the world, and no one is separated by race, creed, social status, or anything else. It is an unforgettable experience. Thanks for stopping by. I hope you learned a little something new! Don't forget to enter the Rafflecopter below! Thanks for sharing! It is so nice to gain knowledge and hear the personal part of the story! Such valuable information Amna! 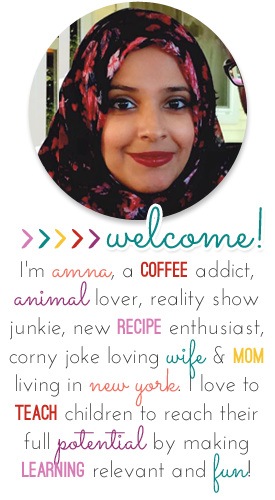 One of my good friend's husband is Muslim, and you have educated me more in this blog post than she ever has! Love all of the crafts you have created! I lived in Middle East for a little while, and appreciate all the differences in everyone's cultures. I think you explained the Muslim holidays perfectly, and even cleared up confusion I had on the differences. Thanks for sharing in such an educating and informative way. Thank you so much for sharing your beautiful holiday with us. You have taught me so much today. I especially love how you put your teacher stamp on all of your class projects. aw amy, I'm thankful to you for having this linky so I COULD take the opportunity to talk about this stuff. Thanks for sharing your traditions and holidays! Travel the holiest cities of the world, praise the one who is worth of and seek his forgiveness. Choose any of the Cheap Hajj & Umrah Tours with Al Hijaz tours and make your journey the most tremendous.